Beautiful renovated carriage house in exceptional location in James Bay. Everything is a short stroll away: parliament, harbour, ocean, grocery, liquor store, etc. Full kitchen, laundry, coffee, and tea included. Cute and Cozy with gas fireplace. The ocean is in three directions from our place, a short stroll away. 1min walk to bus routes. Beacon Hill park is one block away. The parliament is a 5min walk. Close to downtown, yet it is a quiet part of town. Perfect location, private cozy suite, and close to everything! The sofa downstairs is a very comfortable hide-a-bed, if needed. There is no door between the two levels and the bathroom is on the same level as the bedroom. 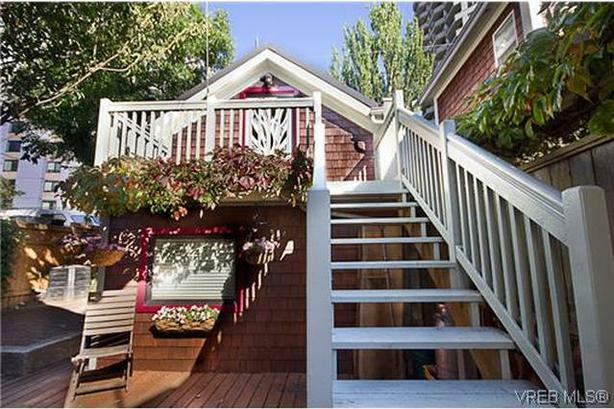 This small space (like a tiny house) is more comfortable for 1-2 people, but could accommodate a family. Rent month-to-month on the 1st- could rent for multiple months. This space is rarely available, but we had a last minute cancellation for May. ***Please Note: The staircase inside is rather steep and not recommended for people with reduced mobility or young mobile children (1-3 yrs old). There is another staircase to access the 2nd level from outside.